Before I tell you what’s in this salad, let me tell you a tale of a Christmas party a couple of years ago. I was assigned to make salad for more than 100 people and this salad immediately came to mind. “Ooh, I know, I know!” I said. And I told the people in charge what was in the salad. “Just trust me,” I told them. They were hesitant. There was discussion of leaving things off the salad and letting people put the toppings on themselves. Finally, the night of the party came and, as things tend to do at large gatherings like that, it became very hectic and we put everything in the salad, thus eliminating the option for people to top their own salads. And guess what? Every single bite of salad got eaten. There was not enough. This recipe has been requested of me more times than any other recipe I have. So trust me, little chickens–I promise not to lead you astray! 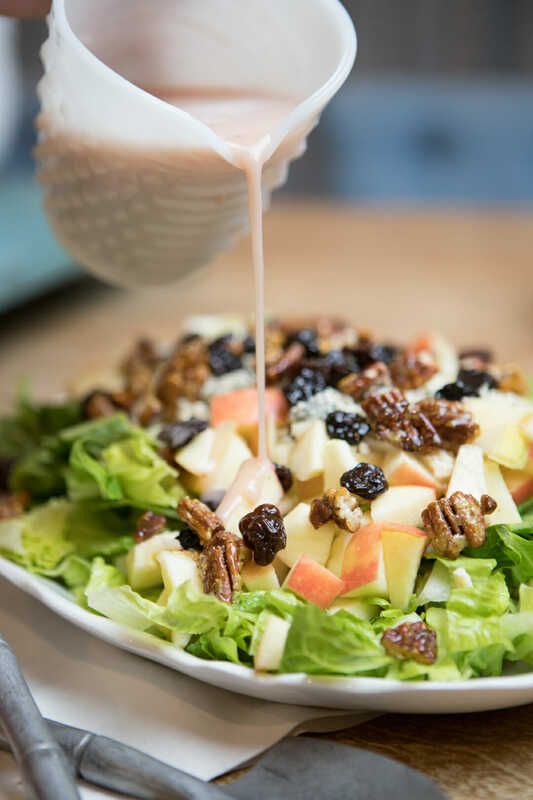 Before you get started–even a few days before–go ahead and make the Honey Red Wine Vinaigrette dressing. Wash and chop lettuce. Set aside to drain. Now…Sara’s method for caramelizing nuts is awesome, and it’s especially good for oily nuts like macadamias and cashews. However, walnuts are lower in oil and I like doing them this way because I don’t have to worry about putting them in the oven. Because, you know, one less dish to wash is never a bad thing in my house. Anyway, to candy the nuts, combine walnuts and sugar in a medium skillet over medium heat. Stir constantly. After a few minutes, the sugar will look very fine and then a few minutes after that, it will start to liquefy. This is when you have to be absolutely vigilant about scraping the bottom of the skillet and making sure everything gets stirred around. The syrup will begin to darken and will coat the nuts. When they reach a golden brown color, remove from heat. Stir occasionally as the nuts begin to cool. 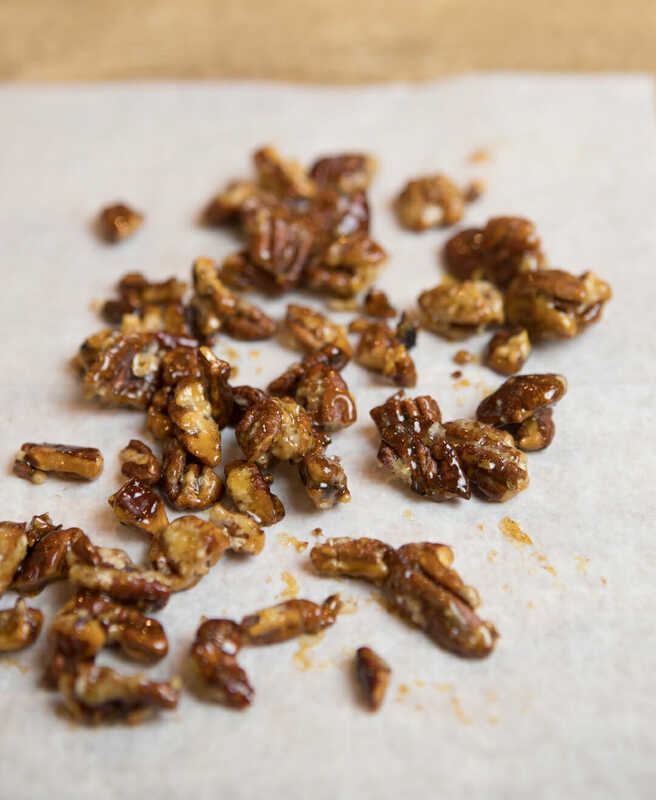 After a few minutes, spread candied nuts onto a greased piece of parchment or wax paper or a greased cookie sheet and allow to cool completely. Set aside. 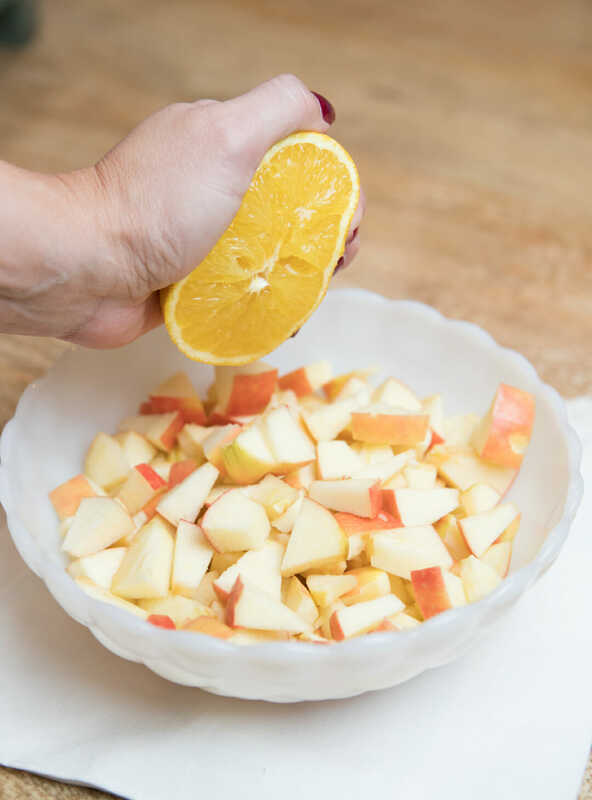 Chop apples and toss in orange juice. 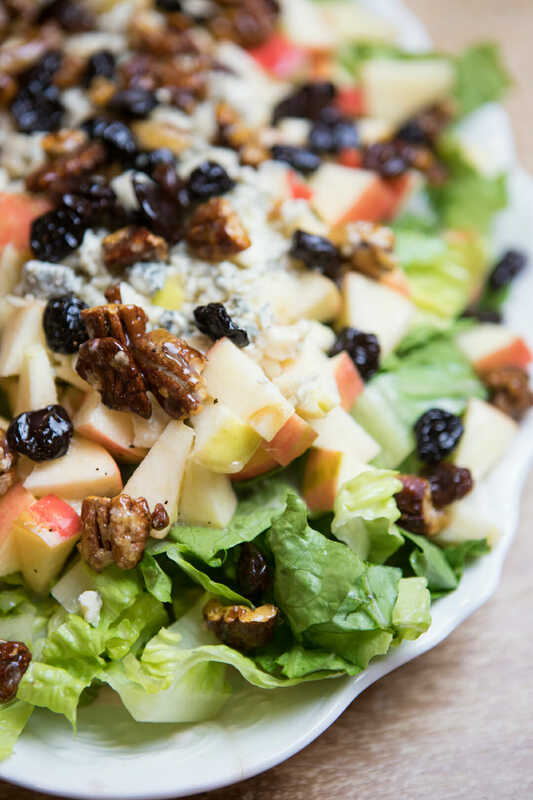 When ready to serve, toss lettuce, cranberries, walnuts, apples, and blue cheese in a large bowl. it really is better all mixed together rather than on top, but the dressing will wilt any leftovers. You guys have your work cut out for you, but Sara and I–we’ll be kicking back in our pajama pants with some hot cocoa because we are DONE cooking for December! That’s not entirely true–we’ll be around for the rest of the month, but all the recipes that we post will be easy, low-mess, low-fuss recipes to help you enjoy the craziest part of the holiday season. Prepare dressing (this can be done a few days in advance). 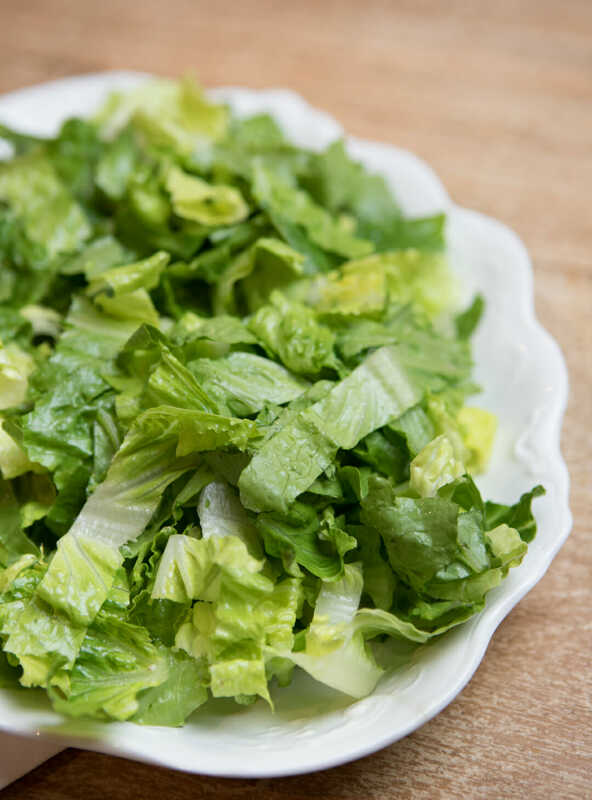 Place chopped lettuce in a large salad bowl. Set aside. 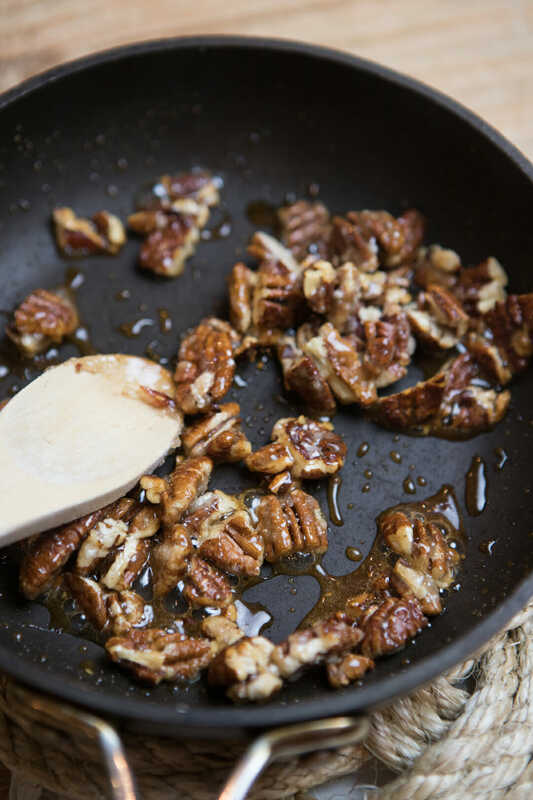 To candy the nuts, combine walnuts and sugar in a medium skillet over medium heat. Stir constantly. After a few minutes, the sugar will look very fine and then a few minutes after that, it will start to liquefy. This is when you have to be absolutely vigilant about scraping the bottom of the skillet and making sure everything gets stirred around. The syrup will begin to darken and will coat the nuts. When they reach a golden brown color, remove from heat. Stir occasionally as the nuts begin to cool. After a few minutes, spread candied nuts onto a greased piece of parchment or wax paper or a greased cookie sheet and allow to cool completely. Set aside. 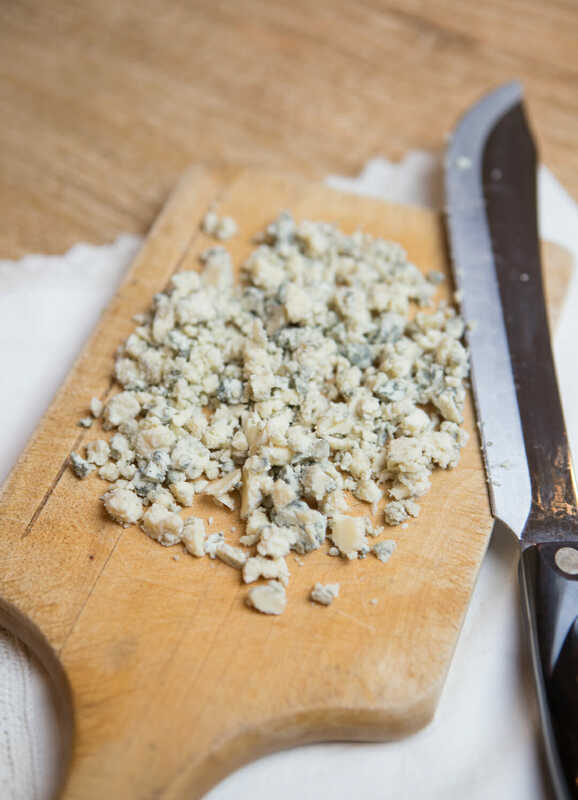 Chop blue cheese or Gorgonzola very finely. Set aside. Ohh, well I think it sounds SUPER DELICIOUS! My mom used to make that salad as I was growing up… I LOVE it!!! The falvors go SO good together! I read your post and was expecting something wierd, then I scroll down and see a salad that I find to be super tasty. LOL, I guess I’m wierd too! I’m not a huge fan of bleu or gorganzolla, they taste moldy to me, but I’ll try it. I don’t mind bleu cheese dressing, just not my fave. It does look super tasty though. I may have to try it when my mom’s around, I know my husband will refuse to eat it! But I might make him try it anyways. As to what I’m looking forward to the most: my parents coming from Indiana on Monday, and seeing my kids’ faces on Christmas morning. I’m looking forward to having my hubby home for the rest of the year to help me entertain the kids while they are out of school! Question, would pecans be just as tasty? They seem som similar but I enjoy (so does my hubby) pecans much more than walnuts. I think this looks fantastic. Well not right now because I’m sick with the stomach flu, but in *theory* it looks fantastic! I love sweet and savory together and I’m totally going to make this when I’m feeling better! Mary, just don’t tell him about the blue cheese–he’ll never know. Seriously, my DH doesn’t know there’s blue cheese in it, but he wouldn’t eat it if he did! Thank you once again! Looks fantastic! 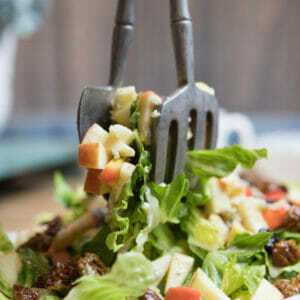 I make a salad just like this and it is my fave, Super-yummy! I appreciate the candied walnut how-to, sooo easy. Thanks! Now that’s my kind of salad. It looks and sounds perfect. This really sounds good, I’m bookmarking this and if i can swing it , I’m making this for Christmas Dinner, thanks! Great salad recipes are so hard to find. I’ll be taking this one to our street’s Christmas party this weekend! Thanks! 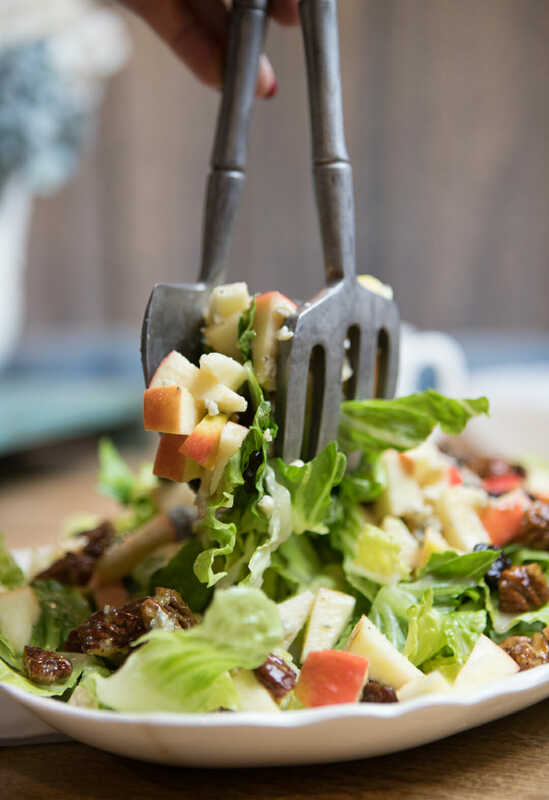 Your salad looks wonderful and perfect for the season. I love blue cheese, and really should use it more often. If I have leftover salad that is wilted from the dressing, I put in in a cheese sandwich. the salad sounds great! I will be trying it for Christmas Eve dinner – Thanks! Shara, you nailed it! 🙂 That’s exactly what it was. I seem perpetually destined for Enrichmenthood–I was on the E. committee for 2 years and now I’m the leader. In a completely different ward. Sigh. Ooooh yum. I think I’ll add that one to my arsenal of delicious salads. i made this salad for an enrichment dinner and for a family christmas dinner we had…both times it was a hit! everyone loved it – including myself! :o) yum! I made this for Christmas dinner and loved it!! This is my new favorite salad. And Kate’s right about the walnuts – you can’t even tell that they’re walnuts. My mother in law asked me if it was popcorn (caramel corn). I am making this for dinner tonight. Just so ya know. And I will think of you with every single bite. I took a chance and made this for a huge Easter party even though I had never tried it myself. I must trust you guys! And, of course, it was a HIT! I have been looking for a recipe like this and was SO glad to find it! (Funny, you posted this in 08 and I just found it… lol). I made this salad last night for a party and everyone loved it. Thanks for sharing. I'm looking forward to making this for a wedding shower I'm hosting tomorrow! I am curious, will one batch be enough for a light luncheon for around 30 women? Julie, one batch won't be nearly enough. With things like this you sort of have to eyeball since all heads of lettuce are different sizes. You'll probably need a few batches. Best salad ever!!! Thanks so much for this post. I made it for Thanksgiving and already again last week because everyone loved it sooo much! Wow thanks for the quick response, you guys are great. Now which one to choose? They both look yum. As soon as I saw reference to this salad I followed the link. The salad sounds amazing – the only thing I’d substitute are dried sour cherries for the craisins. I cannot imagine why anyone would hesitate for a second about combining these ingredients! The dressing sounds terrific, I can’t wait to make it. This looks delicious. I love your website and pass it along to friends and family all the time, so thank you, thank you, thank you!!! Um… those look like pecans in the pictures, but the recipe keeps saying walnuts. Am I going nuts? Lol- good eye Ali! I don’t really love walnuts so I used pecans when I made this and added my pics to Kate’s. Either one works! I always love your salads! I was looking for a quick one for a side-salad and this one seemed perfect. It was! I’ve made salads similar to this one, but never this exact combination, and I love it. We ate it three times this week. I used 1/2 red leaf lettuce (my favorite salad lettuce) and baby arugula, which was the perfect flavor combination for me. Balsamic Vinaigrette is probably my top-favorite salad dressing. I have a pretty good recipe but was hoping you had one. I think it would be great on this salad. Okay, I just have to share this. I had to take a salad to a barbecue last weekend. We ended up with tons of food for our small group and everyone took home lots of leftovers. Well, everyone but me, because I made this amazingly awesome salad and it was completely gone by the end of the night. Wahoo! Thank you, thank you, thank you for keeping me supplied with such fabulous recipes. I think I would shrivel up and die (or at least go very hungry) without you. wow! let me tell ya, I took this to a potluck and it was gone before everyone got to eat. delicious!!! This is very similar to a salad my aunt HAS to make at all our family gatherings. She’s not allowed in without the salad! And it’s gone every time. She uses maple vinegarette and adds pears, but it’s pretty much the same as yours. Made this for Thanksgiving yesterday. Yum! I a definite keeper. Thanks! I love your website, but why is it that some recipes don’t give you the opportunity to just print the text? Some recipes are 7 pages long with pictures, and I don’t always need all that printing of pictures. I have had this salad and it was fantastic, and I am not one to usually care for salads with fruit in them. I made it for my family but forgot the blue cheese. I didnt let on that it was missing something, and they still raved about it. There was none left over. Next time, definitely making sure I dont leave anything out, but none the less, it was a big hit, and was a great way to change up the standard lettuce and greens salad mixture we all tend to make! 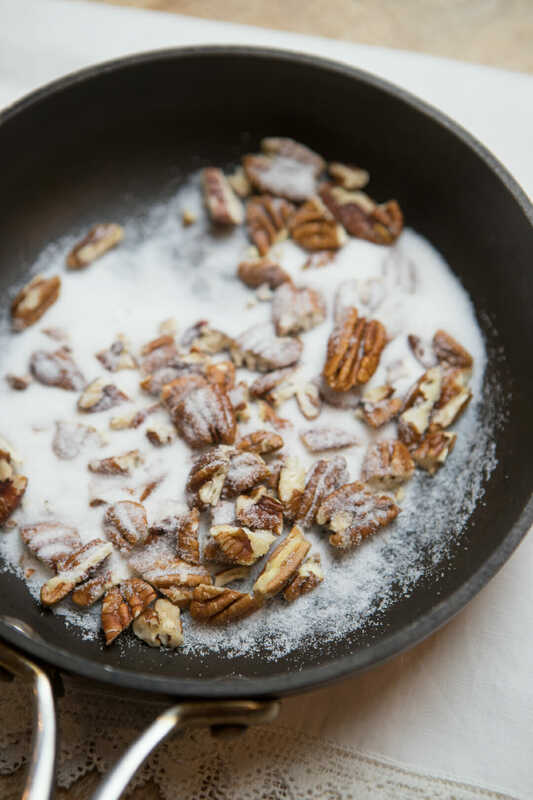 so, which works best– pecans or walnuts? Love this site-so many delicious goodies, I am very much appreciating. I often use pecans instead of walnuts because I like them better, but yes, the recipe calls for walnuts. 🙂 You can use either one and they’ll both be awesome! So good! So, so good! I’m not even a huge fan of blue cheese, but I really enjoyed it in this salad! 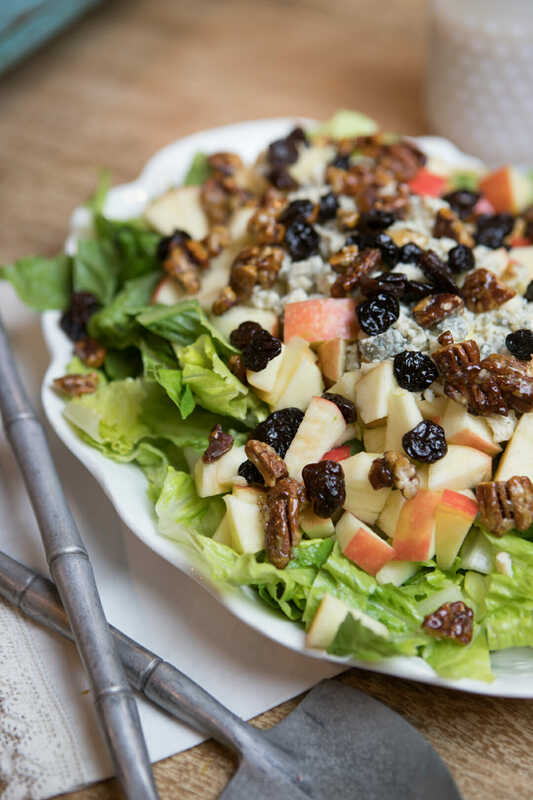 This salad looks very similar to Wendy’s apple pecan chicken salad – which is currently my favorite fast food salad. My only problem is duplicating their dressing – it’s a pomegranate vinaigrette dressing with a taste of orange and I just can’t seem to get it right. I made this to go with our Thanksgiving dinner at it was a big hit! Now I want to make it for a church Christmas party but need some help with the quantites I need. How much did you use for serving 100? I think The Sister’s Café stole your recipe for this salad and the dressing. They posted one that’s exactly the same, even some of the directions are verbatim. p.s. I love the salad and want the right party to get the credit. About how many servings does this make? I’m in charge of feeding 200 people at our Christmas party. The link to the salad dressing no longer works. I have made it before but did not save the dressing recipe. Can you have the link fixed? Sorry about that- it should be working now! This looks really good and I want to make it for my family. I’ll have to use pecans instead of walnuts because my husband and and some of my children get canker sores when they eat walnuts.